July 13, 2013—Global warming and climate change affect all of planet Earth. 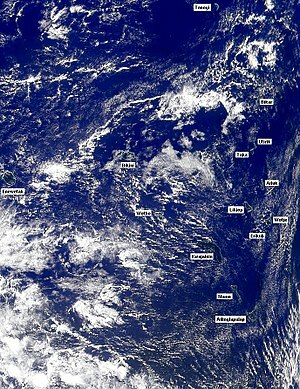 Among the areas that are already severely impacted are the island nations of the Maldives, Marshall Islands, and Tuvalu. Changing wind patterns, more severe storms, salt water intrusions, and rising sea level are currently creating substantial physical and economic problems for the islands. The Maldives are a small group of islands in the Indian Ocean that are already suffering the effects of changes in storm tracks and rising sea level. 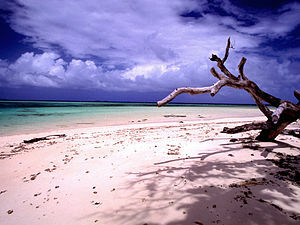 The islands are largely remnants of coral reefs and most of the land area is within three feet of mean sea level. Coral reefs surrounding the islands act as natural breakwaters. Recent storms have damaged the reefs. This has allowed waves to attack the shoreline more frequently and to result in extensive beach damage. There is a net loss of beach, and hence land area, on over half the islands. In April 1987 a large storm in the Indian Ocean generated large swells that traveled through the Maldives. There was a huge loss on the islands in terms of the economy, public utilities, and the land. Some of the islands were permanently evacuated. It is worthy to note that the Maldives was the first country to sign the Kyoto Protocol on 16th March 1998 and the first nation to ratify the Protocol on 30 December, 1998. The Marshall Islands are best known as a testing ground by the United States for nearly 70 nuclear weapons between 1946 and 1958. Now different threats face the island. In addition to those affecting the other island nations a severe drought has resulted in a shortage of fresh water. This has resulted in health problems due to polluted water. In May of this year the foreign minister declared climate change to be the number one threat to the country. Tuvalu is another small island nation consisting of some 11,000 people living on nine small atolls in the South Pacific. The people there are also adjusting to existing and future changes taking place on the islands. A representative of the nation spoke at a recent UN conference and asked for help in adapting to the changes. These islands have climate change problems now that may make many of the islands uninhabitable long before they disappear below the rising sea. Scientific projections suggest that sea level will rise from two to as much as seven feet by 2100. If the rise in sea level reaches even the conservative estimates these nations will simply cease to exist. Categories: Islands and Climate Change | Tags: Climate change, Kyoto Protocol, Maldives, Marshall Islands, Sea level, Tuvalu | Permalink.